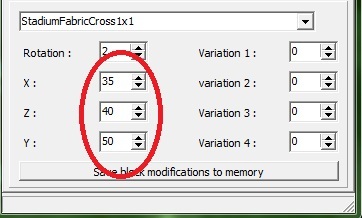 Can you also add these blocks under Z=1 (Z=0) ? dont you mind if i post some track samples mixed increvible far from stadium ? Isnt it possible to put Blocks outside, and i mean those big blocks that peole use to create walls in rpg maps. Outside iff you put them on dirt or grass? yes its possible to put blocks outside the stadium building limits. you have to put all blocks on the grass and then ; open Trackstudio and bring them where you need it and save! yeah, and with TMunlimiter, you can use all those parts (in picture) without having to move them with trackstudio or CE.As you can see until its a long parts (more than 4 blocks long) it can be put at the limits and will go over a bit .but if you use this bug , be sure to save your work before adding it; because you CAN'T ERASE it afterward. ooooo, your right IGNTUL !! i thought i ved just found a new trick!! you cant just put blocks outside stadium with tmunlimiter ;( do i have to change anything ? Last edited by nomÂ² on 11.02.2011, 11:36, edited 1 time in total. how you put bloks out of the map? Last edited by Guest on 17.07.2011, 16:10, edited 1 time in total. You must use ChallengeEdit and put numbers over 32 in the X,Y and Z squares. Because the building area is 32*32*32. So when you put numbers over 32, the block will be out of this area. pick the block on the list you want to move (or clic direct on block in screen. but keep in mind that not all the block can be place there. but i try to put the bloks outside and i open editor but i lost all thinks what is outside.